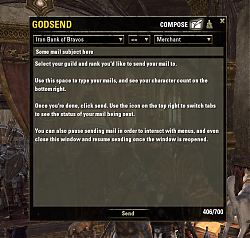 GodSend is a comprehensive but lightweight guild mail tool, designed with Guildmaster and Officer ease of use in mind. With a few clicks, you can be sure your mail reaches everyone you intend it to. Frustrated by the lack of guild management tools within the game, this addon was originally the work of Focus (@Focus23). 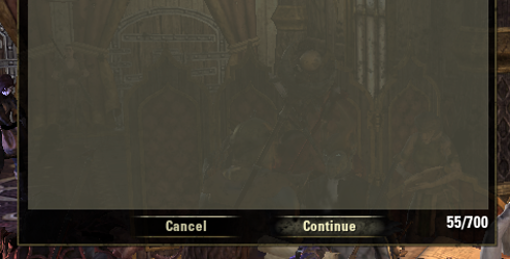 He left the world of ESO, and asked me to continue it in his absence. Once installed, simply set a keybind, and you're good to go! * Compatible with hex codes for color coding titles and content. * Ability to choose guild and rank from a simple drop down menu. You can use < and > logic to send to multiple ranks as well. * Sending can be paused and resumed, allowing for opening menus and interacting with objects. Window can also be closed; mail contents will remain until the mail is complete or until a reload UI is performed. I'll gladly take suggestions for new features as well. Godsend est un outil de guilde électronique complet mais léger, conçu avec Guildmaster et agent facilité d'utilisation à l'esprit. En quelques clics, vous pouvez être sûr que votre courrier arrive à tout le monde que vous souhaitez à.
Frustré par le manque d'outils de gestion de guilde dans le jeu, cet addon était à l'origine le travail de mise au point (@Focus23). Il a quitté le monde de l'ESO, et m'a demandé de le poursuivre en son absence. Une fois installé, il suffit de définir un keybind, et vous êtes bon pour vous! * Compatible avec les codes hexadécimaux pour la couleur des titres de codage et de contenu. * Possibilité de choisir la guilde et le rang d'un simple menu déroulant. Vous pouvez utiliser <et> logique pour envoyer à plusieurs rangs aussi bien. * L'envoi peut être interrompu et repris, permettant l'ouverture de menus et d'interagir avec des objets. La fenêtre peut être fermée; contenu du mail restera jusqu'à ce que l'e-mail est terminée ou jusqu'à ce qu'une interface de rechargement est effectué. Je serai heureux de prendre des suggestions pour de nouvelles fonctionnalités ainsi. Godsend ist eine umfassende, aber leichte Zunft Mail-Gerät, bei dem Guildmaster und Offizier einfache Bedienung im Auge behalten. Mit wenigen Klicks können Sie sicher sein, Ihre E-Mail alle erreicht man es zu beabsichtigen. Frustriert durch den Mangel an Gilde-Management-Tools innerhalb des Spiels, war dieses Addon ursprünglich die Arbeit von Focus (@Focus23). Er verließ die Welt der ESO, und bat mich, ihn in seiner Abwesenheit fortzusetzen. Einmal installiert, einfach eine keybind gesetzt, und Sie sind gut zu gehen! * Kompatibel mit Hex-Codes für Farbcodierung Titel und Inhalt. * Fähigkeit, Gilde und Rang aus einem einfachen Dropdown-Menü auswählen. Sie können < und> verwenden Logik als auch auf mehrere Reihen zu senden. * Das Senden kann angehalten und wieder aufgenommen werden, so dass für die Menüs zu öffnen und die Interaktion mit Objekten. Fenster kann auch geschlossen werden; Mail-Inhalte bleiben, bis die E-Mail abgeschlossen ist oder bis ein Reload-UI ausgeführt wird. Ich werde gerne Vorschläge für neue Funktionen übernehmen als auch. Updated with language localizations for French and German. Still need to update these for the sort headings, but now showing properly for rest of the addon. Updated API version to remove Thieves Guild versioning. Fixed an issue with character count not updating correctly - truncation function was allowing mails longer than 700 characters, so some people were experiencing cut off mails. Thanks again to Pathway - some additional edits made to work around the character limit and truncation when copying in mail content and to eliminate the carriage returns from outside programs. Added string.gsub function to account for carriage returns when copying text in from outside programs. Character count will also properly reflect this. Thanks to @Pathway for the help with this. Updated for compatibility with both live and Dark Brotherhood PTS patch as I'm doing some testing there. Added variable sendDelay in several places in the code - I eventually want to have a settings menu to accomodate future features and this will allow users to set custom throttling intervals as they choose. 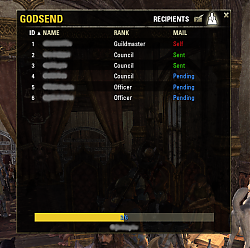 Just a heads up, my wife got a social ban using this addon to send mails to her guild. It sent 32 mails and then stopped, apparently triggering the automatic anti-spam detection. It can be adjusted. I'm currently getting a handful of the Wykkyd addons uploaded, and should have this uploaded in the next couple of days. I've added an option to adjust the timer in between mails. 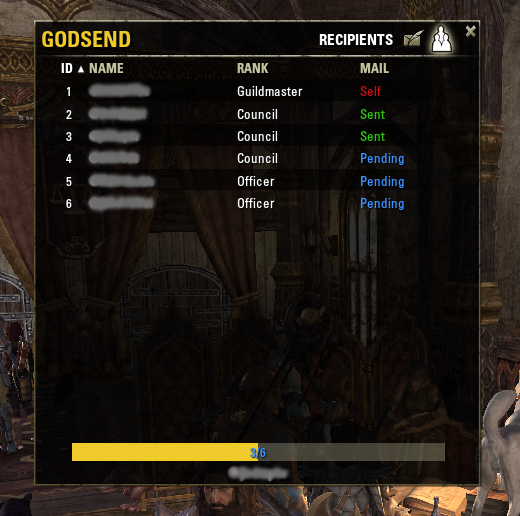 Is there a way to specifically choose who gets the mail, and not just by guild rank? That's something I've got planned. Ultimately I'm planning on a rewrite of Mailr with Godsend integrated into it, but it's going to take some time. Working on the Mailr integration, and it already does progress of sending on the 2nd tab. Mailr updates coming shortly (I work on both, but started a new job recently and have been in the process of moving as well). i switched now to GodSend, because it will be actievly supported. So what's the different / benefit against MailR? Mainly character count. Ravalox and I are planning on reworking Mailr and combining Godsend with it, along with Wykkyd Mailbox, but that's going to involve a major rewrite of Mailr. Huge thanks to Pathway - we got the carriage return bit figured out. Only quirk is if you have a mail that's around/over 700 characters (not counting the carriage returns) the mail will be truncated when pasting it into the edit box, so you may have to work around this a little bit. Tested this with one of my own guild mails that was previously showing as 694 characters, now coming up at 677. Last edited by calia1120 : 04/30/16 at 05:40 PM. Someone FINALLY explained this problem to me!! In Windows an [enter] has an extra character. This is unnecessary and the game can support writing a mail without the extra character, but if you write a mail in another window, or copy it out of the game and back in, Windows will add all those hidden extra characters. So however many [enter] you have in the mail your message will lose that many letters off the end. This should be solvable by either writing your mails in the Godsend window itself, or by deleting all of the enters and then re-adding them in Godsend, or by using macro to remove the extra characters. Calia, talk to Pathway. He explained this to me and he might be able to suggest a built in fix for it. Awesome! I tend to write my mails in GodSend, copy them out to OneNote for a record of what I send, and paste them back in when I need to, so I haven't really run into the issue myself, but I'll catch up with him and see if we can figure something out. Wow! Thank you so much for solving that mystery haha. Will have to do that from now on. Last edited by elffromspace : 04/29/16 at 12:39 PM. Mails are limited to 700 characters, and spaces and line breaks are included in this. Using hex codes for colors also eats up some characters as well. That's one reason why the character count comes in handy - you can tell whether or not a mail is going to get cut off. I should have clarified, 693 characters. That is including hex color codes and all. Sorry for the bad wording on my part. Last edited by calia1120 : 04/29/16 at 08:35 AM.